THEY are unlikely internet stars, a retired Cypriot couple in London who bicker and duel as they potter around their kitchen. But Andreas Theodoulou and wife Christina have entertained thousands of YouTube users and introduced them to the delights of Greek cuisine. The couple, who live in Haringey, north London, were filmed by their son, Orthodoxos, as they prepared popular Greek dishes such as meatballs and stuffed vine leaves. Their antics share the simple charm of My Big Fat Greek Wedding and, as with that low-budget screen hit, the winning ingredient is romance. 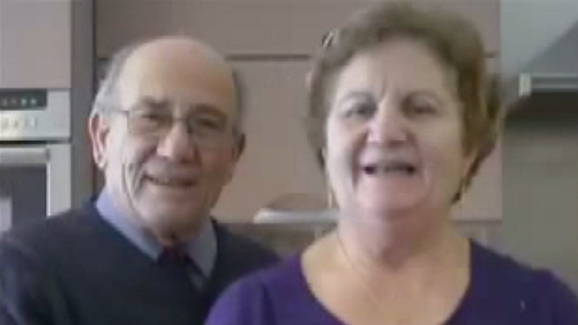 After more than half a century together, the Theodoulous are still clearly in love. The couple speak in heavily accented English, although some of the joshing is in Greek. Orthodoxos has included English subtitles but has bowdlerised his father’s earthier turns of phrase. The couple’s age and supposed sexual politics are subverted with gentle humour. In one sequence, Andreas squeezes lemons to a rap song. In How to Make Fajin (lentils with rice), an argument over who should peel an onion is settled by a snappily edited karate fight that appears to spoof The Matrix. Mrs Theodoulou wins: her husband peels the onion. In Stuffed Vine Leaves, Andreas, 76, a retired garage foreman, slaps Christina, 69, on the backside when she bends over to pick up a lemon. She knees her “big guy” in what he calls his “crown jewels”. The Theodoulous have attracted a large and enthusiastic following on YouTube. “So do they do special appearances and how much do they charge? Better than George and Mildred any day … Best still, their meatballs are fantastic!” one viewer enthuses after watching the couple’s first video, Greek Meatballs. The couple had no idea how well known they were until they attended Easter Mass in London and were congratulated by many Orthodox churchgoers. “When they went to Cyprus this year they were stopped by crowds asking if it was really them,” Orthodoxos said. There is similar adulation from Melbourne and Johannesburg.